The majority of iPhone users who have been patiently waiting for the upcoming jailbreak solution were dealt a little bit of a blow by Apple today. 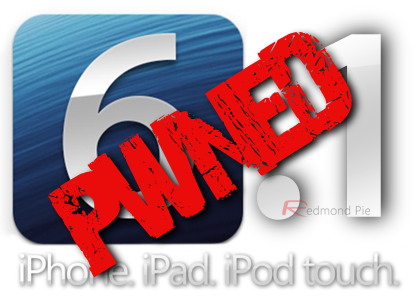 The individual members of the newly formed Evad3rs jailbreak team have been publicly begging Apple to push out a final release of iOS 6.1 so that they can apply the final touches to the untethered jailbreak, but instead Apple replied with yet another beta of iOS 6.1. A minor set-back for most, but the ever-present silver lining is that those who have access to the fifth beta of iOS 6.1 can also enjoy a tethered jailbreak on older A4 devices through the use of Redsn0w. A lot of fuss has been made about the fact that the latest beta seed doesn’t actually appear to be a true beta in the normal understanding of the word relating to Apple releases. The firmware activates without the need for developer registration, it doesn’t have any expiry date, and the build ID is that of a final build, meaning that this could actually end up being the final build of iOS 6.1 and the exact same piece of software that the public will see going live in the very near future. Essentially it is like a GM seed, but without the official name-tag. A4 and below (iPhone 4, iPhone 3GS, iPod touch 4) device owners still have the ability to liberate their devices with this build through the ever-reliable Redsn0w tool. The ability to perform a tethered jailbreak on these devices may not be a huge comfort to those who have been patiently tolerating a stock iOS experience on one of Apple’s newer pieces of hardware, but the reality is that there is still a lot of users who make use of A4 powered hardware daily. The iPhone 4, the iPhone 3GS and the fourth-generation iPod touch are all powered by Apple’s A4 and below processors and therefore capable of being liberated from Apple’s walled garden through the use of the iPhone Dev-Team’s famous software, thanks to the fantastic and longstanding Limera1n exploit. As always, it is worth noting that the iOS 6.1 beta 5 jailbreak on the aforementioned devices is of a tethered nature. This means that whenever the device is rebooted or entirely powered down and back on it will need to be connected to the computer and injected with the exploit once again through Redsn0w to ensure that it is in a jailbroken state. We covered a full tutorial on how to jailbreak iOS 6.1 beta when first beta was released. The instructions for jailbreaking 6.1 beta 5 are exactly the same. Download iOS 6.1 beta 5, and simply follow our guide posted here to jailbreak iOS 6.1 beta 5 on iPhone 4, iPhone 3GS and iPod touch 4. Those who have newer hardware, such as the iPhone 5 or iPad mini, shouldn’t have to wait too much longer for Apple to drop the public release of iOS 6.1 so we can see the Evad3rs go to work.